4:40pm EST - The devblog is out! 4:30pm EST - We're hosting PoonGalore with some fresh wipe gameplay on our channel! 4:25pm EST - The client and server update have hit! 2:00am EST - The builds are complete and our staging server is up to date with the new progression system! It has some bugs and still needs a ton of balance, but stay tuned for a bunch of tweaks before the update goes live. 1:30am EST - Today is not only the first update of the month (including the forced wipe on all servers), it marks the inception of the newest form of progression in the game. On top of that, we’re seeing the first natural landmarks along with some other tweaks. Here's a summary video from Puddy on the new progression system. If you played Rust prior to July of 2016 (before XP or components were introduced), you likely already have a solid grasp on the fundamental concepts of this new progression. A hybrid of the blueprints and components, Blueprints 3.0 brings back the idea of learning a blueprint before being able to craft an item. Additionally, it introduces several levels of work benches, requiring you be in front of a certain work bench to make particular items. Perhaps now more than ever, it is important to note: large changes to the game such as this require extensive testing and balance. The loot tables alone for a shift of this magnitude may require weeks of tweaking and retooling before getting to an ideal state. The good news is Helk told me he’s improving on how the loot tables are set, providing more automation for easier tweaking going forward. With that in mind, please be patient with this new system, especially in the first week, as things are bound to need balance. This implementation of blueprints borrows much from previous iterations. Low level items are ‘default blueprints’ - meaning everyone on the server knows how to craft them by default. Most items, however, require that a player learn the blueprint prior to being able to craft. Once learned, blueprints are tied to each player on each server. That means if you learn a blueprint on one server and then join a different server, you will have to acquire and learn that blueprint again. Blueprints generally don’t wipe every time the map wipes, so it is advantageous of players to stick to servers which they’ve already learned blueprints on. 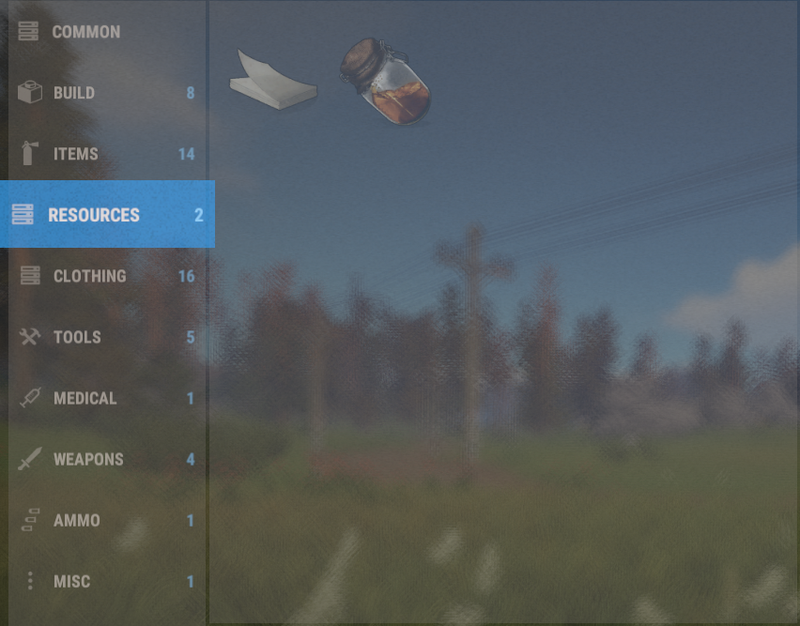 Although server owners can choose to wipe blueprints at any time, Facepunch generally doesn't force a blueprint wipe unless a change to the game dictates a fresh start. On Rustafied servers, we plan on only wiping blueprints when forced by Facepunch. How do you get blueprints? There are several ways to obtain blueprints. Like a rock or torch, they are items in the game, meaning you can drop them on the ground, trade them with friends, or find them in others loot. Unlike other items in the game, you can also use a research bench to create a blueprint. Once you have a blueprint in your inventory, if you haven’t learned it already, you can click a button to learn the blueprint. The second you do that, the item disappears, and you are able to craft that item on the server (provided you have the required resources, components, and workbench access if needed). Similar to repair benches, research tables can be crafted (with a level 1 work bench) and placed around your base. Standing in front of one, you’ll be able to place an item and a specific amount of scrap to create a blueprint. If you played Rust back during the old blueprint system, this will sound very familiar. Back then, you’d use BP Fragments along with an item to gain a certain percent chance of generating a blueprint. This new scrap system, although similar, is not a game of chance like the researching of old - a specific amount of scrap will definitely yield you a blueprint. Vending machines may become much more advantageous for proprietors and customers alike as Helk has added specific functionality for trading blueprints. In the administration panel, when setting your sell orders, just click on the little blueprint item (if applicable) and the vending machine will sell the blueprint instead of the item. Edit: Eoka, handmade shells, gunpowder, metal shopfront, vending machines, and crossbow have been made default blueprints. A concept fresh to this version of Rust, but not entirely new (if you played Legacy), work benches have been added. With 3 levels, work benches not only speed up crafting, they are required to make certain tier items in the game. Each higher level workbench requires items which can only be crafted by the previous level, meaning you can’t skip ahead by crafting a level 3 work bench without having a level 2 bench already. You’ll also be able to find workbenches in certain rad towns, but risking all the resources to carry them into a highly contested area probably won’t be worth it more often than not. As far as speed is concerned, bonuses on crafting times are based off the tier item versus the level work bench. An item requiring a level 1 work bench will craft much faster in the direct vicinity of a level 3 work bench - up to a 75% increase in speed. 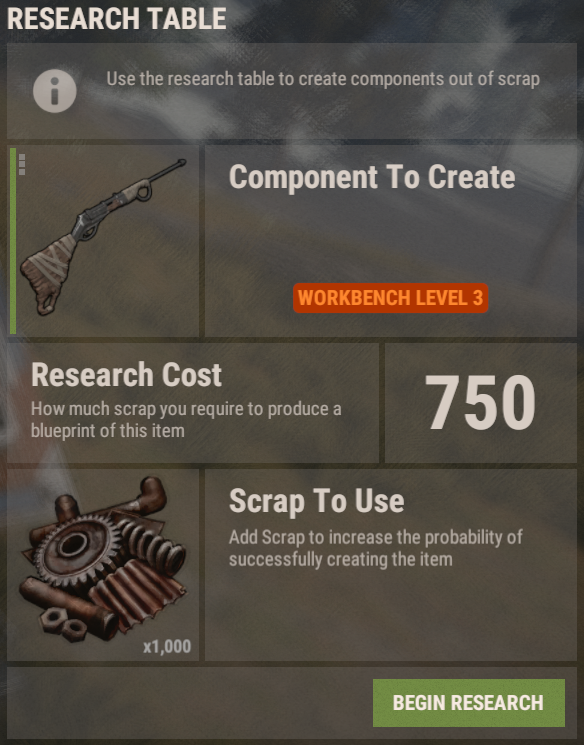 Edit: The scrap prices of work benches 2 and 3 were just increased. New values added above. Loot tables have completely changed. You now find whole items much more often and scrap in almost everything. Check out a raw print of the current loot tables here (thanks to Maxaki of Blueberry servers for this info). Heading up north post-wipe, you’ll notice some changes to the surroundings. Ice lakes, the first iteration of natural landmarks, have been added to the snow biome. These lakes come in two sizes (small and large) and can be built on like normal ground. These new sheets of ice not only provide help points of reference, they offer some of the flattest building surfaces known to Rust! They vary in characteristics; some lakes have rocks in the middle, some are just flat. Also, some large versions include a broken down truck. Although there is no loot to be found in the truck, it does appear barrels and food crates spawn around these lakes. There are several of these natural landmarks per seed. They don’t really stand out on the map, but you can find them by looking for the slight oblong indents in snowy areas. As you may recall from previous devblogs, this snow biome revamp also included some ice sheets and new icebergs. Unfortunately, those still need some work and have not made it in this week. That said, expect those and more natural landmarks making their way into procedural map generation in the near future! As with many first updates of the month, today's patch includes shifts to procedural map generation. Beyond the Ice Lakes mentioned above, there have been some changes to how roads generate. Using a new algorithm, road creation is now much faster and better looking. Although it isn’t 100% continuous, roads now avoid being split by monuments - instead, they prefer going around.